Like New Condition Japanese Vintage Formal Silk Kimono with Orange silk Obi. White Silk with Handpainting! Comes with Tatami Mat shoes and Tabi Socks (We only have size 8.5-11 in women's shoes and socks in stock. 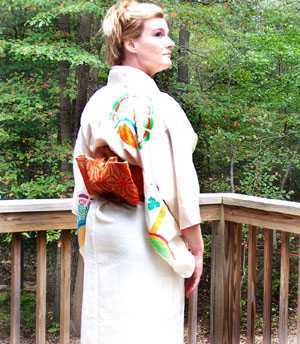 This Kimono fits up to woman's size 12 USA. Bonus Free when you buy a kimono/obi set: DVD - How to wear Kimono and Tie Obi Underkimono is not included-but could be ordered.